When it comes time for makeup brands to release their holiday edition collections, we thought we pretty much knew what to expect. Lots of silver and gold, rich jewel tones, and deeply dramatic lip colors. 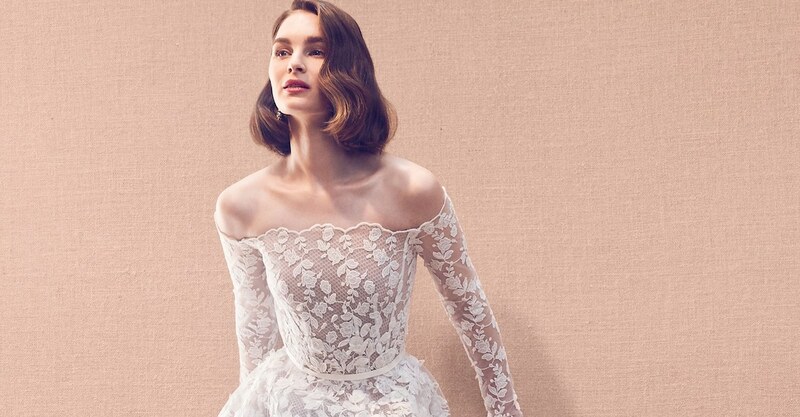 There’s a reason they are perennial favorites: they are consistently stunning! 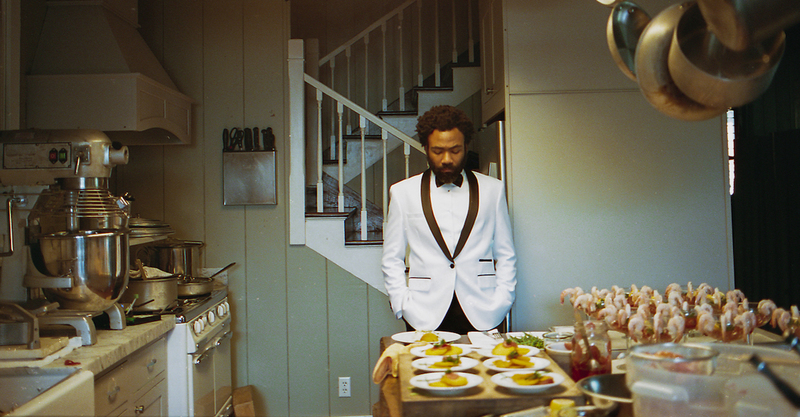 Of course, there is always plenty of room for brands to get creative and debut some unexpected surprises. 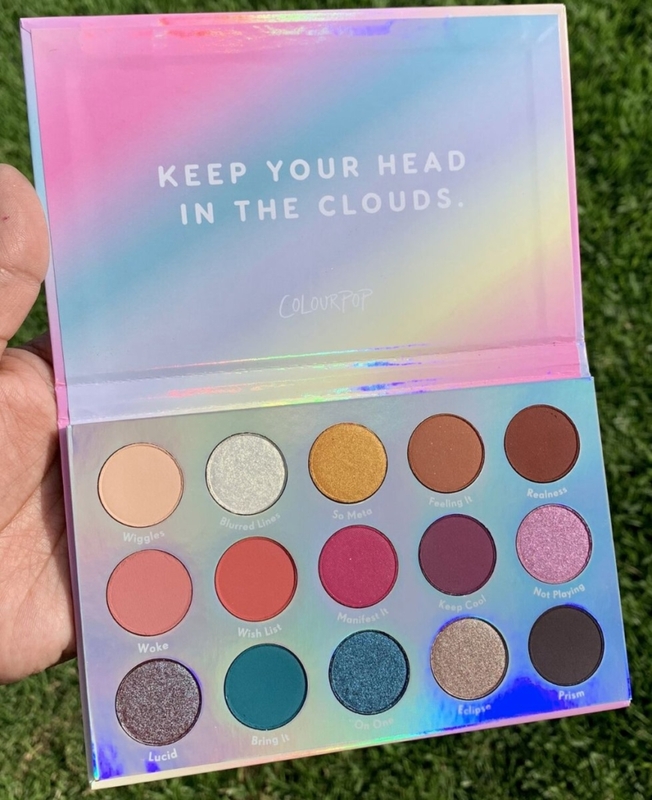 But we were still floored by the new ColourPop Holiday 2018 range – because it’s all about celebrating every color of the rainbow. 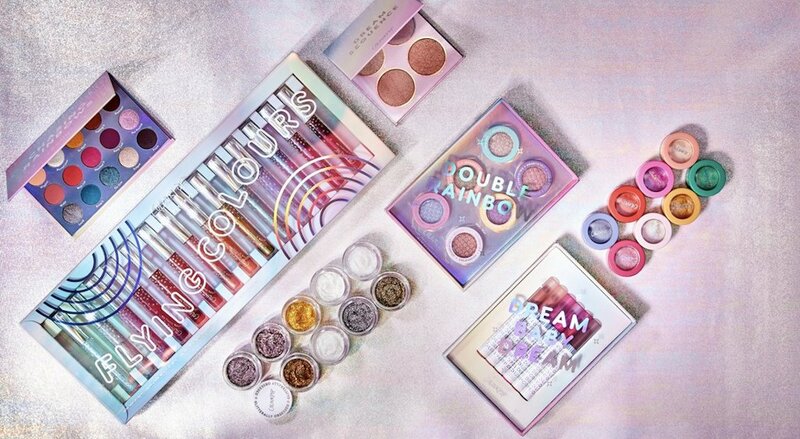 From eyeshadows to lipstick shades, highlighters, and more, this new ColourPop launch goes all out with the pigment, shimmer, and packaging. Which is perfect if you’re thinking about gifting these sets to a beauty guru this year – or restocking your own makeup bag with some new favorites this winter. 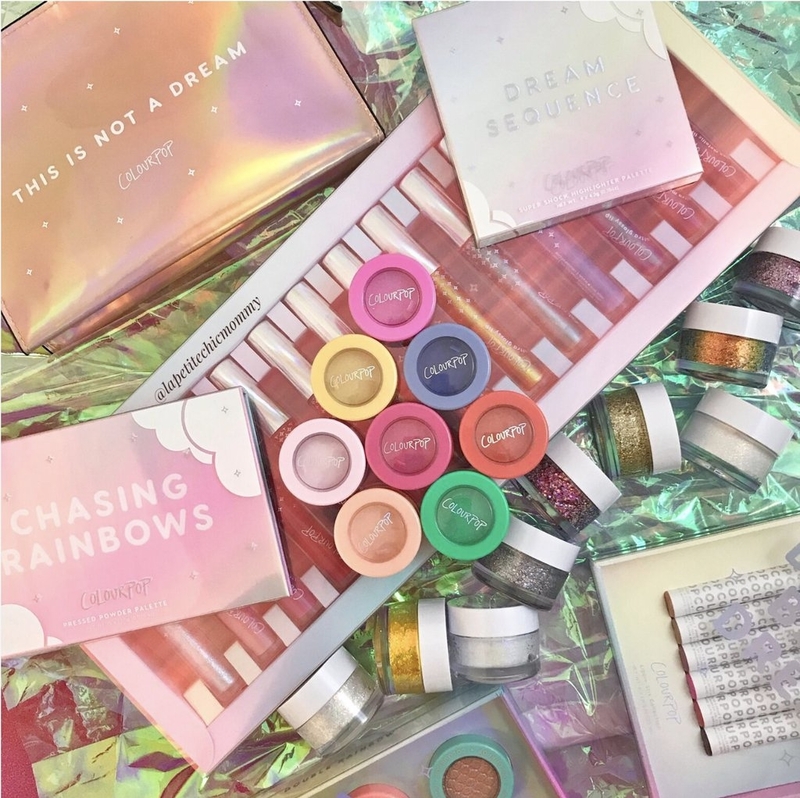 The ColourPop Holiday 2018 collection is made up of the Chasing Rainbows Eyeshadow Palette ($20); the Flying Colours Lip Vault ($80); 6 new Super Shock Shadows in the Double Rainbow Set ($25); 8 new Jelly Much Eyeshadows ($8 each); 9 new Glitterally Obsessed Body Glitters ($8 each); the Dream Sequence Super Shock Highlight Palette ($18); and 6 new Lippie Stix in Dream Baby Dream Kit ($25). You can also pick up several of these ColourPop Holiday 2018 collection pieces as affordably-priced singles. The new Jelly Much Shadows you can expect to shop in are in the lovely shades Morning Light, Hallucinogenius, Sweet Dreams, Wide Awake, No Rest for the Vivid, Into Focus, Wavelength, and Crystal Castle. Dazzling new Super Shock Shadow shades include REM, Falling Up, Roy G. Biv, IRL, ZZZ, and Milky Way. Meanwhile, Glitterally Obsessed colors Avenue of the Stars, Star Party, Starfire, Outside the Lines, Dream About Me, Wish Me Luck, Eternal Sunshine, Puffin, and Keep It Plutonic make a statement. Super Shock Highlighters will be available in the shades Counting Sheep, Guilty Pleasure, Mr. Wind, and Pinch Me. On the lips, you can stop the Ultra Glossy Lip shades Starburst, Paper Moon, Dust2Dust, Hypno-Tease, Stratus Update, Dreamaholic, and ‘Round Midnight; Ultra Satin Lips in Pitter Ponder and Make Believe; Ultra Metallic Lips in Morning Glory and Nimbus; and Ultra Matte Lips in Skyfall, La La Land, and Chronos. This season’s Lippie Stix shade names are Dream Date, Happy Thoughts, Are You Surreal, At Twilight, Sky Walking, and Infinite Best. Honestly, we can’t even narrow this range down to the pieces we crave most! 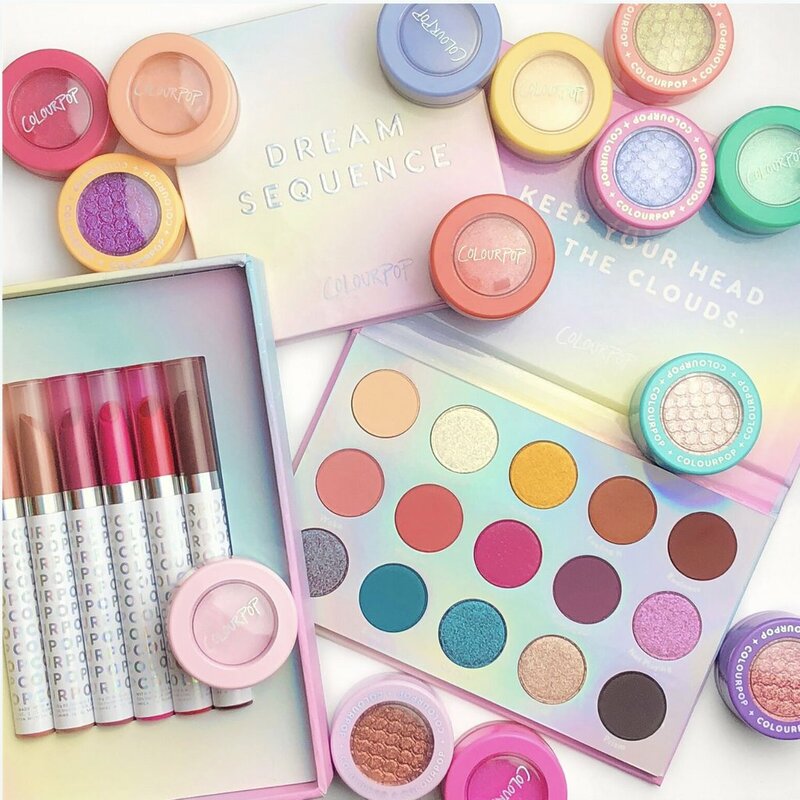 You can shop the full ColourPop Holiday 2018 collection on the brand’s website now. More news from the ColourPop Cosmetics brand. More Holiday 2018 beauty collections to check out.